Coleraine boss Oran Kearney hailed Neil McCaffertyafter the midfielder’s dramatic late free kick earned a share of the spoils on Saturday. McCafferty is fast earning a reputation as a dead ball specialist and he proved why as he curled home another sublime effort at Windsor Park. The 30-year-old stepped up with the last kick of the game to level the score and give the Bannsiders a deserved point. It signalled wild scenes of celebration on the visiting bench and amongst the travelling support as referee Raymond Crangle blew the full time whistle as soon as the ball hit the back of the net. “If you score one or two free-kicks then that’s decent, but that is seven free-kicks this season. “It has become a habit and we called them penalties up our neck of the woods. “He is fantastic at set-pieces, and he could be into double figures. “Neil is a talker. You saw him at half-time talking to Shane McGinty. That is brilliant. You want the older players looking after the younger lads. For McCafferty it’s all in a day’s work, or maybe not as he revealed afterwards. “It was on the perfect side for a right-footed player, so I had a go,” McCafferty said of his late strike. “When it went in I asked the ref ‘is that it?’ and he blew the whistle for full-time. “You sort of know when you hit it whether it is on target, and I got it up and over the wall. “We had a couple of chances before we scored, and it looked like being another one of those days. “It hasn’t been the story of our season, but we have had days when it just hasn’t happened for us. “I have 11 goals this season, and I think Burnsy (Linfield’s Aaron Burns) is the only midfielder who has scored more goals than me. He has 13. “I don’t actually practice free-kicks in training – to be honest I don’t really train,” McCafferty joked. “I do a few jogs and a few stretches. “I have been playing a lot of games, especially through Christmas. Oran (Kearney) knows I look after myself. I go to the gym myself a couple of times a week and do my own thing. “I am flying at the free-kicks this season, so I am not going to start practising them in case I start missing. 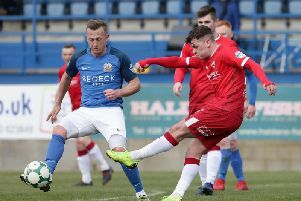 The midfielder is clearly revelling in the role being charged upon him by Kearney as he also revealed he was never really involved with set pieces at his former club Portadown. “When I was at Portadown I was told to stay away from free-kicks and corners, and I drifted out of games,” he said. “That’s not the case here, I get involved,” he added. McCafferty was delighted to see the depleted Bannsiders get something for their efforts at Windsor Park, especially with so many young players in the team. “It was very dramatic finish,” he said. “It’s good for us as a club, we’re not a big, big club like Linfield, we’ve a lot of young players and a good sprinkling of experience down the middle, we are going in the right direction. “Compared to some of the young players I’m like an old player and I’m only 30, I’m 13 or 14 years older than some of them. Our two full backs have been outstanding this season. Adam has played nearly every game and Lyndon has taken his chance and played every game since. “They are talented players and it’s great to have the likes of ‘OG’, ‘Dougie’ and ‘Snowy’ in beside to help them. McCafferty revealed he almost didn’t make the starting eleven as he and Stephen Douglas had pre-match fitness tests to endure. “Both myself and Dougie did a fitness test before the game and whoever was the fittest, which was by no means fit, had to play. I was fitter than him so I had to play,” he said. The Bannsiders were down to the bare bones at Windsor and were only able to name four substitutes. Kearney handed a league debut to midfielder Oran Barton and praised his young charges after the enthralling game. “When you have the likes of Hegarty, Douglas, Ogilby and Neil McCafferty helping out the young lads it’s excellent,” said Kearney. “Good senior professionals look after you and in the changing rooms they are an asset in helping the young players through. “Young Adam and Lyndon were excellent throughout. “Lyndon is about 12 games into his senior career and I watched back the highlights and the anticipation for some of his blocks were top notch. “In my own experience, it is better to blood a youngster in from the start rather than coming on as a substitute. “It is difficult to adjust to the frantic pace of the game. You have to give him 60 or 70 minutes, rather than the last 20 minutes. “Oran has all the attributes to be a top player. Linfield boss Warren Feeney took his frustration out on referee Raymond Crangle after the game. “To concede in the manner that we did I thought was a disgrace,” he said. “I’m all for the referees I know they have a hard job, but I would like to check Raymond’s watch. “We timed 97 minutes and as soon as that ball hit the back of the net the game was over. “Can you not blow the whistle as the player is running up to hit the ball, or can you not blow it when the ball is in the air? “How does the referee know that is the end of the time bang on? That must be some Christmas present he got.